It’s not given to many men or women in the entertainment field to say that they created a genre and even George A. Romero himself would resist being labeled as such. He freely admits in interviews that he “ripped-off” Richard Matheson’s I Am Legend in his creation of NIGHT OF THE LIVING DEAD. Me, I think he’s way too hard on himself. Sure, he may have used Mr. Matheson’s brilliant horror/science fiction concept as the springboard for his own now classic horror masterpiece. But I believe that Mr. Romero brought enough of his own ideas to this interpretation of Mr. Matheson’s book that NIGHT OF THE LIVING DEAD does indeed qualify as a brilliant work of cinematic art in its own right. And besides all that, it’s simply a damn good movie whose main desire is to keep us on the edge of our seats, biting our nails for 96 minutes and it succeeds. 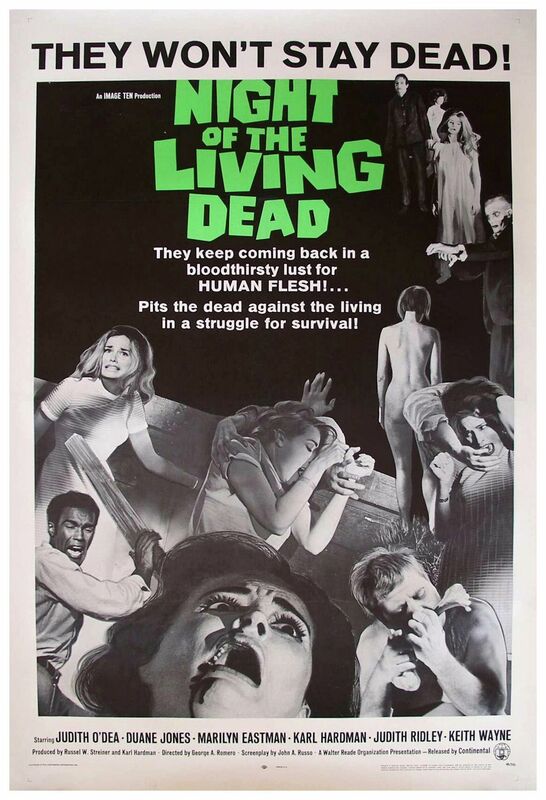 And besides, considering the hordes of zombie movies that came after NIGHT OF THE LIVING DEAD, many of them true rip-offs, remakes, imitators, reworkings, parodies and the like, if Romero feels any guilt about ripping-off Matheson, then being ripped-off in return must soothe his conscience. Even video games such as House of The Dead and Dead Rising owe their creation to NIGHT OF THE LIVING DEAD. It’s the day when Daylight Savings Time goes into effect when we meet sister and brother Barbra (Judith O’Dea) and Johnny (Russell Streiner) who are visiting their father’s grave in a rural region of Pennsylvania. It’s in the graveyard that we get the now famous “They’re coming to get you, Barbra” scene as Johnny teases her in that truly annoying way brothers tease their sisters. Having two sisters myself I am quite familiar with this technique. Barbra is creeped out by a strangely behaving man coming towards them and doesn’t think that Johnny’s “They’re coming to get you, Barbra” is very funny and pretty soon Johnny doesn’t think it’s funny either as the man attacks them both. Barbra gets away and with the zombie in pursuit manages to find refuge in a farmhouse. Also taking refuge in the farmhouse is Ben (Duane Jones) who has to take charge of the situation as the shock of her experience is catching up to Barbra. They soon find they’re not alone. Hiding in the basement is the married couple Harry and Helen Cooper (Karl Hardman, Marilyn Eastman) who barely escaped from a gang of zombies that overturned their car. Their daughter Karen (Kyra Schon) has been unconscious ever since she was bitten by a zombie. Teenage sweethearts Tom (Keith Wayne) and Judy (Judith Ridley)likewise sought safety in the farmhouse after hearing an emergency broadcast. Harry and Ben immediately start doing the alpha male dance, each insisting their plan for survival is best. Harry wants to stay down in the basement and keep quiet. Ben’s plan is to turn on every light in the house, make as much noise as he can boarding up the windows and doors and playing the radio as loudly as possible. Remember this because I’ll come back to it soon. While the radio reports that all over the United States the dead are coming back to life and eating the living, the small group attempts to survive the night against the growing number of zombies attacking the lonely farmhouse. That’s if they don’t kill each other due to their constant bickering and inability to work together. NIGHT OF THE LIVING DEAD always gets praised for having as its hero a black man. 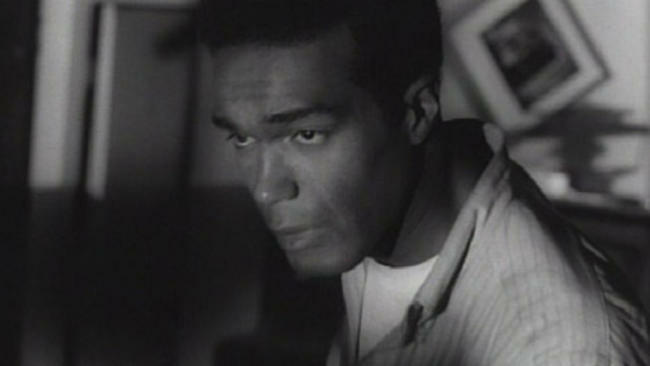 And as Ben, Duane Jones is certainly heroic looking and heroic sounding. He takes charge. He’s resourceful and courageous. He offers hope to the others that they will survive the night. He makes plans. Unfortunately those plans also get everybody killed. Next time you watch the movie, watch it a little more carefully. Each and every thing that Ben does ends up getting somebody killed. Ironically, Ben survives the attack of the zombies by doing what Harry said right from the start: go in the basement and be quiet. Ben’s turning on all the lights and making all that noise is what draws all the zombies to the farmhouse in the first place. Makes me wonder if the statement the movie is making about having a black man as the hero isn’t the one that everybody praises it for. But that’s a conversation for another time. 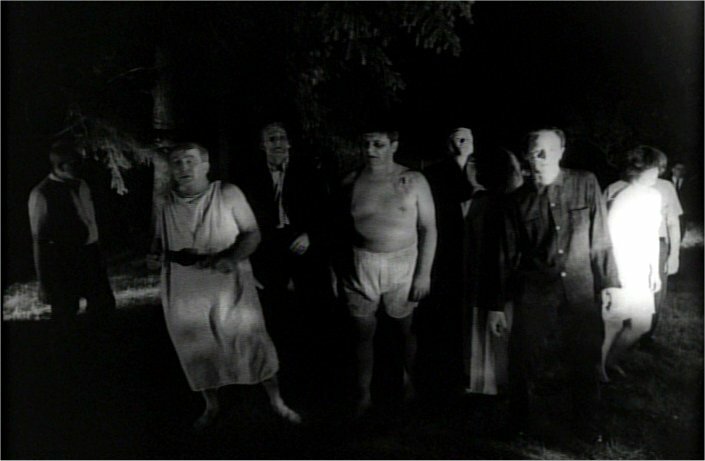 Taken as pure entertainment, NIGHT OF THE LIVING DEAD still holds up for me. It’s filmed in a documentary-like manner that should be studied by those filmmakers who are so in love with shaky-cam. NIGHT OF THE LIVING DEAD is a perfect example of how to make your audience feel like they’re in the middle of the action without giving them motion sickness. Supposedly the cast improvised much of their dialog and I believe it. There’s a real heat in the scenes between Harry and Ben as they’re struggling for control of the farmhouse’s resources and the group. For me, a lot of what makes this movie still effective is that nobody looks or acts like a movie star. For better or for worse they act like regular people caught up in a really terrifying predicament. 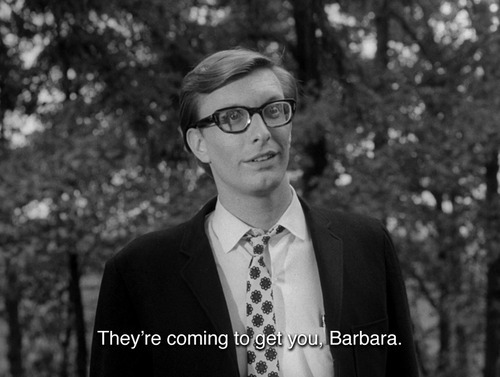 So should you see NIGHT OF THE LIVING DEAD? Without a doubt. It’s one of the greatest and most influential horror movies ever made. You’ve probably seen one of the two remakes (1990 and 2006) or the six sequels that were made. If not, it’s a sure bet you’ve seen one of the many zombie movies influenced by the original. Somewhere in your personal movie watching history you’ve seen a zombie movie, I’m sure. So why not take a look at the classic that started it all?